My mother kept some unusual things. She was not one for material possessions and donated items regularly for flea markets at the church. She didn't hold on to dishes, knickknacks or clothes. Rather, she kept our report cards, concert programs and newspaper articles of interest. One item we found in her apartment after she died was the front page of the Evening Telegram of St. John's, Newfoundland, the day after President Kennedy died. 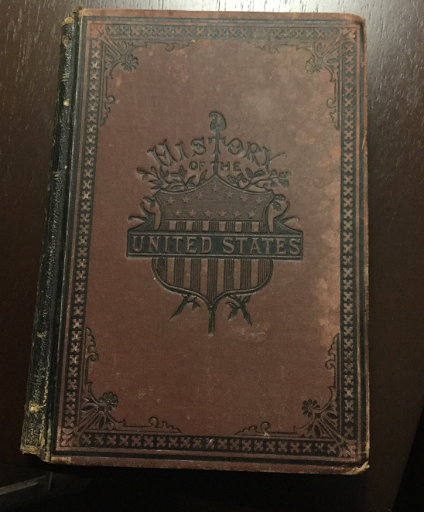 We also discovered this book, The History of the United States. When Mom and Dad purchased our home in Mount Pearl in 1958, they bought it from an American man, his Newfoundland-born wife and two daughters. The book had been left in the house. Mom kept it and after she was gone, so did I. There is a line through this inscription. My family has no connection to any of these people. Since 1958, it has been in my family, before that, with the previous owners of the house. How does that family link to the people named in the book? The surnames are different. Who were the people behind the names? Where did they live? How were they connected? The website ancestry.com has an Abigail Abbie Conklin born in New York, lived 1828-1897. Could this be the same Abbie? I have not found a potential Alice or Ray. Mom liked history, mystery and old books too. 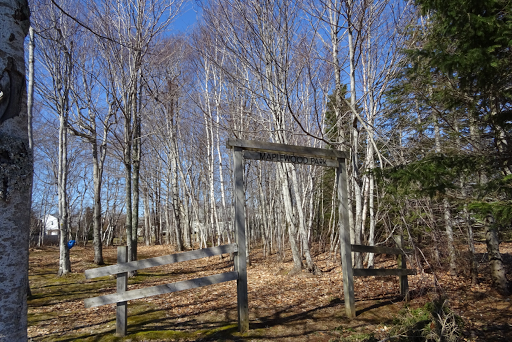 We put out our clothesline last week on a glorious spring day, 15 degrees Celsius, with a nice breeze. It was a grand day for clothes, as was said in our neighbourhoods when we were growing up in Newfoundland. Every woman loved a day when she could put the clothes on the line and they'd dry quickly. Any beautiful day you also heard, "This would have been a grand day on clothes." The women were sorry to miss such a great day for the washing. We are the only ones in the neighbourhood making that comment now since we live in a different province. But there are other changes too. 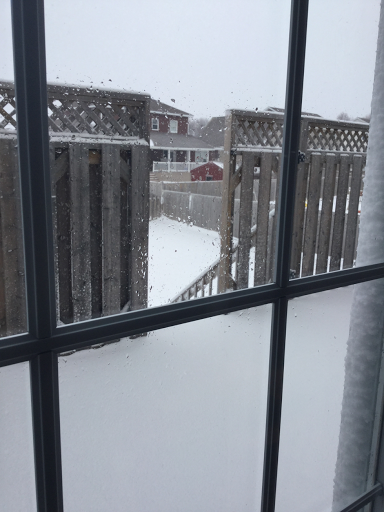 In our neighbourhood today, there are very few clotheslines and if there are any, they are small. 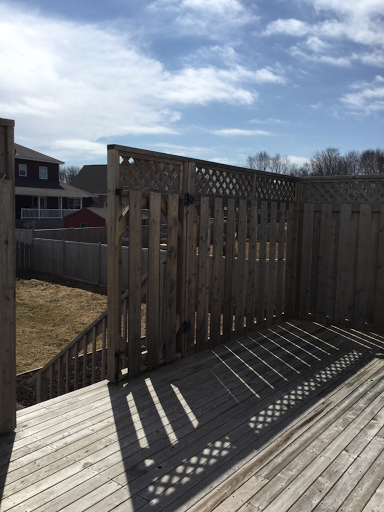 Gone are the days when huge lines of clothes hung in the back yards, blowing in the breeze. Our line is one of those square umbrella clotheslines which can hold lots of clothes but just doesn't look right. Long gone are the frozen clothes, brought from the line in winter, frozen into shape. I remember my grandfather's overalls, frozen stiff, hung from a line behind the stove in their kitchen. Now, we too are part of the clothes dryer society for six months, rather than brave the elements, hanging out and taking in frozen clothes. Gone too are the conversations with the neighbours as you hang the clothes. Most of the women in the neighbourhood now are working outside their homes. There is no one in the area to speak with during the day. The sharing of family news and discussion of current events or gossip don't occur over the clothesline any more. Many people barely know their neighbours. These days, we are the dinosaurs of the neighbourhood; the oldest people on the block, hanging out clothes, ready to talk to anyone who happens by...Oh, there's the letter carrier! Besides, on those grand days here, the man of the house hangs out the clothes. 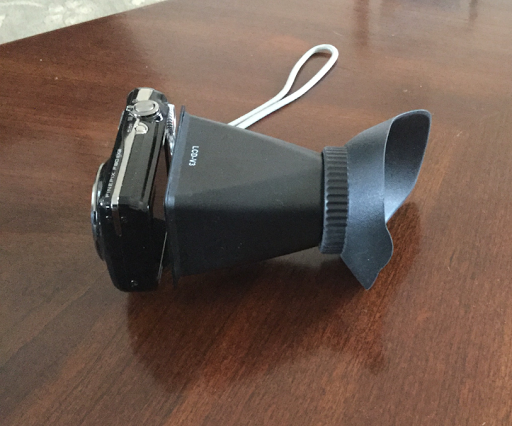 Screen blindness has been a problem with my camera. On a sunny day, I cannot see what I am shooting. One solution, short of buying a camera with a viewfinder, is buying a sunshade for it. While it was difficult to find, we eventually ordered a sunshade on-line, from a Canadian company which shipped it from China. It was ordered on March 5th, shipped on March 7th and the projected arrival date was April 19th. My husband, Rick and I thought it was on a slow boat from China. The weeks passed. Finally, on the 19th, the sunshade was in the mailbox when we arrived home. And surprise! It was shipped by air. It must have been in a warehouse waiting its turn for transport. Regardless, it reminded us of the old song On A Slow Boat To China. Written by Frank Loesser, it was published in 1948. I love this version by Guy Lombardo and His Royal Canadians. It highlights the big band era, some of the music my parents would have listened and danced to during their courtship and early married life. Enjoy! It is time for spring cleaning. At least, that's what Mom always said. Every spring and fall she went through the entire house, cleaning walls, windows, washing everything in sight. The last week of her life, I was visiting and did it for her. 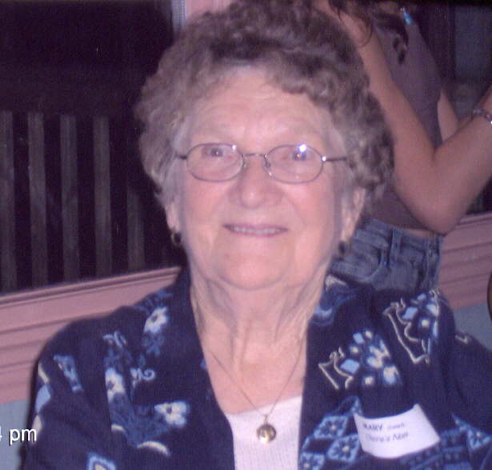 She has been gone for eight years but spring cleaning washes away those years as well. Nan always did spring cleaning too. Everything was washed out, aired out and washed up in preparation for summer. Mom learned from the best. In the days of wood, coal and oil stoves, the walls were a mess after a long winter. Everything had to be sparkling clean for the days when the windows could be open and the screens put in place to keep out the flies. Air would flow through the house again. Mom spent the last years of her life living in a spacious apartment in my brother's home. She was happy there, continuing the lifestyle she enjoyed, without the responsibility of the family home. Except for spring cleaning, always the spring cleaning, though the old stoves were long gone. 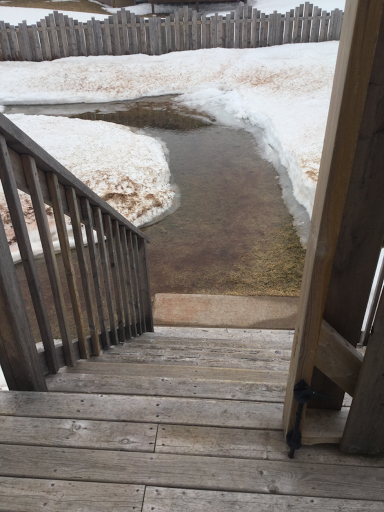 After the long winter of 2008, I made the first trip to St. John's to visit Mom on April 13th. She had found the winter hard because she was not out as much as usual. Mom was looking forward to our shopping expeditions, eating out and visiting family and friends as we usually did. However, she was different as she knew and I was to learn. We didn't do the usual, staying in the apartment instead and talking. In my heart, I knew she was near the end, and as is usual for me, I did housework because I was anxious. Mom was glad to have the cleaning done, though her apartment was not dirty. It was hardly dusty. It did not pass the dirty water test. Mom liked to see the water become dirty when she cleaned because it proved her efforts were not in vain. On the morning of the 20th, she woke up, and as I helped her out of bed, she died in my arms from a ruptured abdominal aortic aneurysm. A shock, sudden, but not unexpected! Yesterday as Rick and I started our spring cleaning, Mom was in my head and heart, gone but not forgotten. 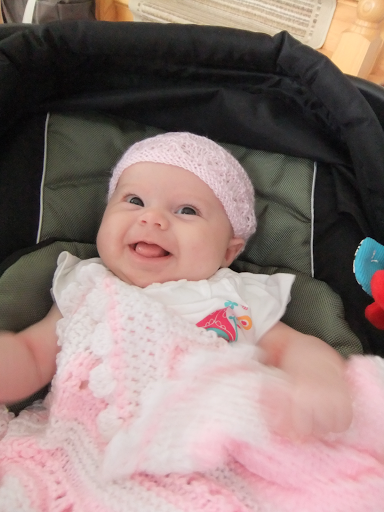 She was a reluctant newborn with a tenuous hold on life. Since that time however, just five years now, Sylvie has celebrated that life with joy. Her very being is a testament to love of life including movement and dance. 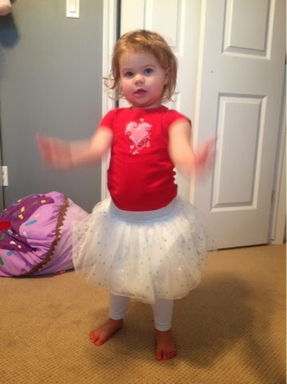 Sylvie, who turned five earlier this month, has a dancing spirit. 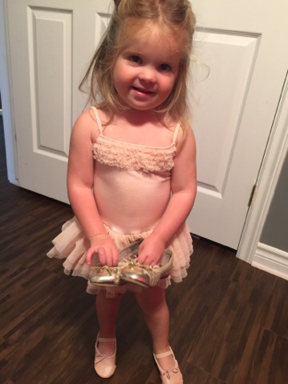 Her mother introduced her to The Nutcracker ballet on Youtube the Christmas before her second birthday. Sylvie loved it and wanted to watch the whole performance. She watched Angelina Ballerina as well and liked to do " ballet moves" as she called them, with the characters during each show. Sylvie liked ballet! Her parents, wanting to encourage her interest, enrolled her in classes the year she turned three. She enjoyed them, with an enthusiasm that was infectious. 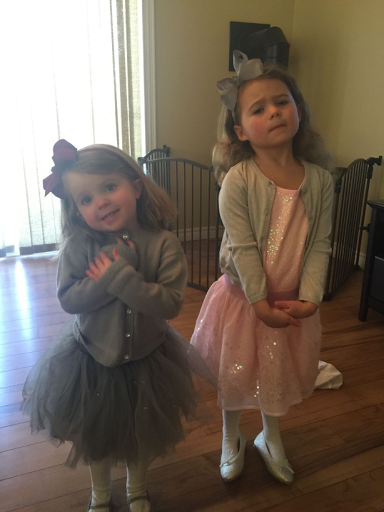 Her younger sister, Caitlin started the ballet moves at an early age too, and mimics her sister. Caitlin is heart broken every time her sister heads off to ballet class because she cannot go too. Sylvie especially enjoyed the year-end show, where she was on stage twice. She enjoyed every minute of the performance and is looking forward to this year's show when she is on stage three times. Sylvie has a flair for the dramatic as you can see. Before Christmas last year, the family went to Moncton to see the local production of the Nutcracker and Sylvie was enchanted with everything about the show. Even two year old Caitlin, though a tad squirmy, was also fascinated with the performance. 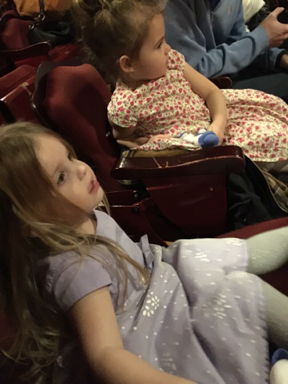 Last weekend, their grandfather and I took the girls to see an afternoon performance of Sleeping Beauty by Ballet Jörgen at the local theatre. 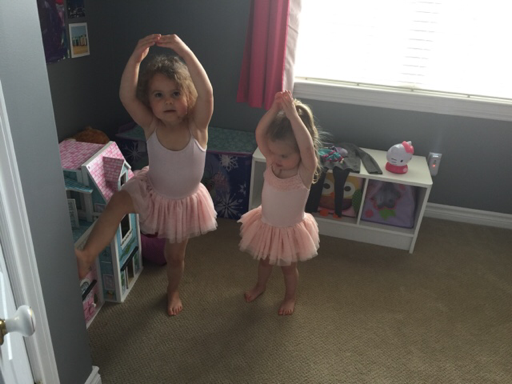 Tchaikovsky's music means ballet to the girls and when the curtain rose and the music started, they were enthralled. Sylvie was riveted for the whole performance while Caitlin checked in periodically. She was her three year old self for the two hour show. While I love ballet and classical music, my husband is a country music fan. He wanted to experience the performance with the girls. Besides, one of us could take a misbehaving child out of the theatre while the other stayed. We joked about Rick needing to be the one who would have to be taken out. His love of his granddaughters outweighed his own reluctance to watch ballet. 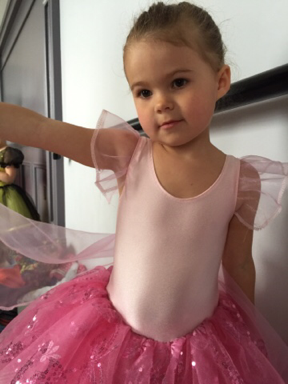 Sylvie has told her mother that she dances in her dreams and has performed the role of Clara from the Nutcracker. On this day, during the intermission, before the curtain went up again, Sylvie said, "You know Nanny, I'm going to be up there one day." Who knows what Sylvie will do, what she will become? Her ability may not match her interest in ballet. 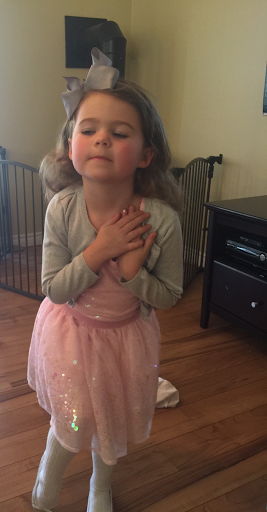 I do know that for a five year old, she has an incredible attention span and interest in dance, especially ballet. We, her family, will continue to encourage her to follow her dreams. Next year, it's Swan Lake...without her grandfather! Our island home of Prince Edward has had an environmentally friendly approach to garbage for over a decade. Living in such a small area, slightly larger than the state of Delaware, you can imagine the amount of garbage its population of 140,000 could generate, covering our pastoral setting. When the sorting of garbage became the focus, people worked at re-using, giving away or selling items. Some items pass through numerous hands before they are discarded. A recent item on a local Buy and Sell or give-away site read, "I have a lot of magazines to give away. Read only once." On-line today, there are websites selling books, new and used. Often while reading a book club selection, I read some of the author's other work, or a book mentioned by one of the characters. On-line, it is possible to acquire out-of-print books for a good price. Recently I read Alice Munro's Dear Life in which one of her characters mentioned Wild Geese, written by Martha Ostenso in 1925. I bought Martha's book on-line and thoroughly enjoyed it. If you buy such used books, there are descriptions of the condition of the books. Some books are available for a penny; delivery costs raise the price but are not prohibitive. I have received books from England, the United States and Canada, within the estimated arrival time and in good condition. These old books make my mind work overtime. Who was the book's first owner? How many times has it changed hands? Why did the readers decide on this book? Where has it traveled before it arrived at my door? What did the other readers think of the book? While the magazines may have been read only once, I am more intrigued with books which have a history of ownership and work for the imagination. 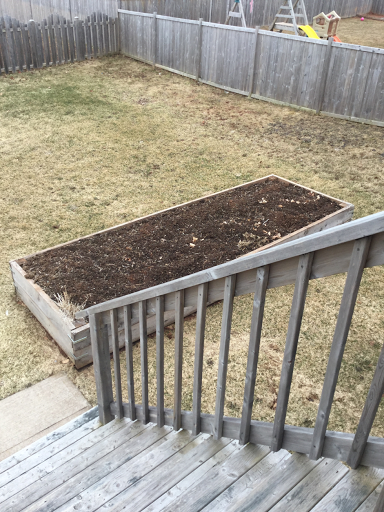 Some say El Niño made the difference. Whatever it was, we are grateful! It was sunny but cold, the promise of a spring day brought me out for a walk to the park. 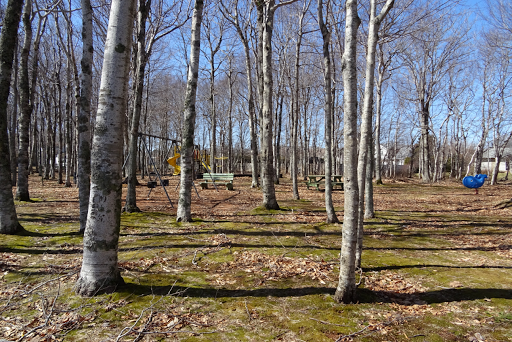 This park is where we take our granddaughters, when weather permits. It's been months now since our last visit but the girls have not forgotten. When they see the park, they mention it, wondering when we will go back. 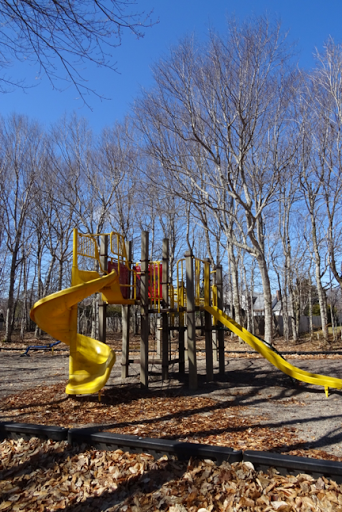 It was encouraging to walk around the park that day, with so much to look forward to, children on the slides, swings, monkey bars, see saws, conversations on the benches and picnics. Before long, the grounds will be cleared of the leaves and branches but despite the debris, it was beautiful. 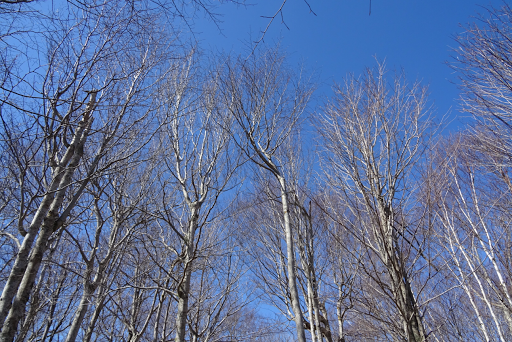 The maple trees, outlined against the blue sky, showed the promise of new growth. 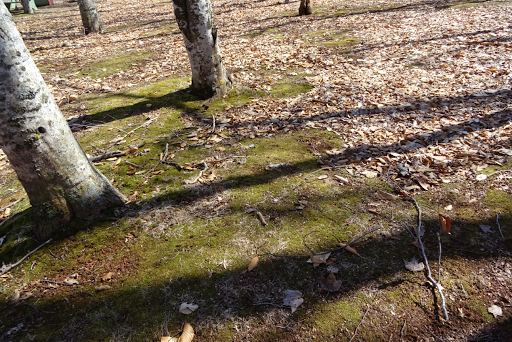 the soft moss muffled my footsteps. It was peaceful and still, as if the park was sleeping, about to rouse from a long snooze. It too was waiting! 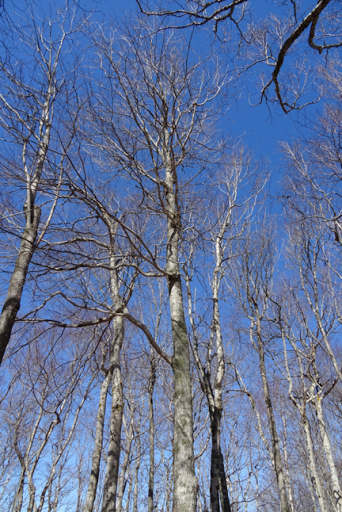 The eye could not help but be drawn upward to the branches and their embrace of the deep blue sky. The moment was memorable. Martha knew our northern home so well. Two days ago, there we were, on the deck cooking lunch. 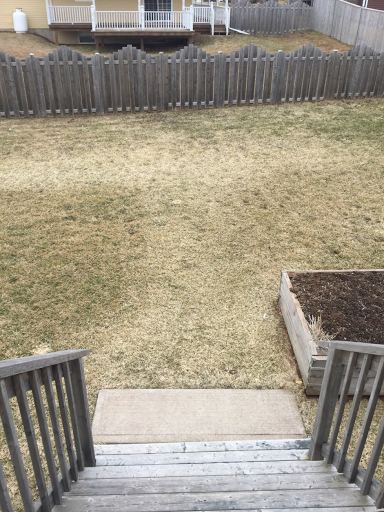 Rick had scraped the ice off the deck from the previous day's winter-like onslaught. Camp chairs and table were at the ready, barbecue in place, winter jackets on; we were prepared for our first barbecue of 2016. The glasses added a bit of class. We had saved the bottle of champagne, not for any personal milestone, but for the first time we could barbecue this year. This was the day, in spite of the snow on the lawn. 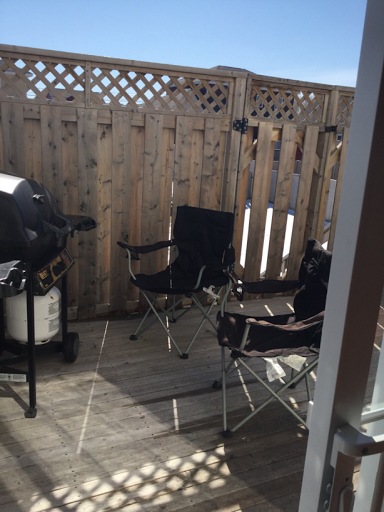 It had been too long; we were anxious to experience the ambience of early barbecue season in eastern Canada. As Newfoundlanders say, "It's cold enough to freeze the arse off ya." And so it was, with the wind moving around the frigid air, making it hard to sit there. Winter hats and mitts would not have gone astray. But we persevered; the champagne helped. 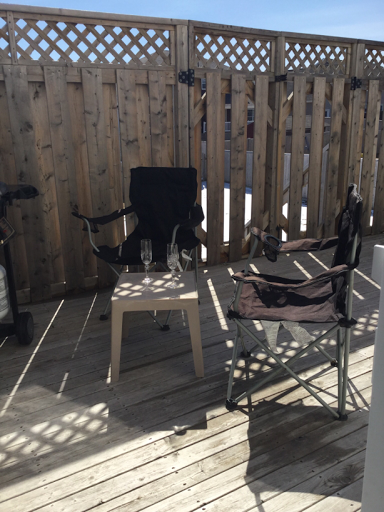 Before long the patio furniture will find its way to the deck too and we will eat most meals there, taking in the sun and the fresh air for as long as we can. The barbecue will be busy many days; friends and family will join us. Yes, it's been cold enough..for too long! Remember the smell of home made bread? Coming home from school to fresh bread and molasses was a great treat. 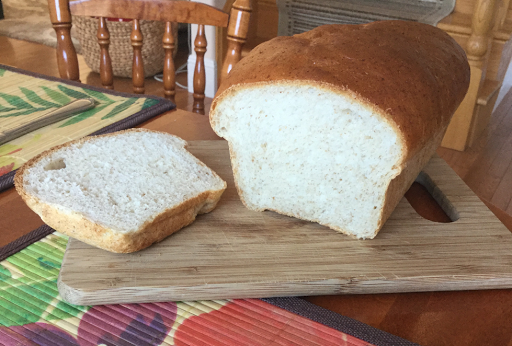 Mom always made great bread! My grandmother O'Brien made wonderful bread, three buns in a round pan. Nan knew the piece of wood needed to bake the bread to perfection. The stove was stoked winter and summer, on the hottest days, because bread was such an essential part of the diet. The thick slices were eaten with molasses or jam. We didn't know what store-bought bread was when we were young and many of our friends were the same. The sandwiches we took to school were made of homemade bread. As we grew up, eventually some classmates had store-bought or baker's bread for sandwiches. That bread became a status symbol and we wanted it too. Baker's bread became the sandwich bread taken to school. When we married, neither Rick nor I made bread so baker's bread was the standard fare at our house. Over the years, I stopped eating bread for the most part, a few slices a month were the most I ever ate. Rick was the bread eater. Then we discovered it! When his father was sick, Rick visited his parents. While he was gone, I put the loaf of bread in a cool place and forgot it. Six weeks later, I discovered the bread, just as fresh as the day it was bought. Anyone who makes bread knows how quickly it will dry out and go bad. What is added to the baker's bread to preserve it? Scary thought indeed! Thus began the quest for the perfect homemade bread. A new mixer with a dough hook and a variety of flour later and we have it. Three small loaves of bread per batch, made to order, rye, twelve grain, whole wheat or white with wheat germ. It is delicious and we know what is in it. Rick has perfected the process, a mix of ingredients, chemistry and skill or sometimes luck. Maybe I will become a bread eater again. Do you know what is in this photo? Those who grew up in eastern Canada know. 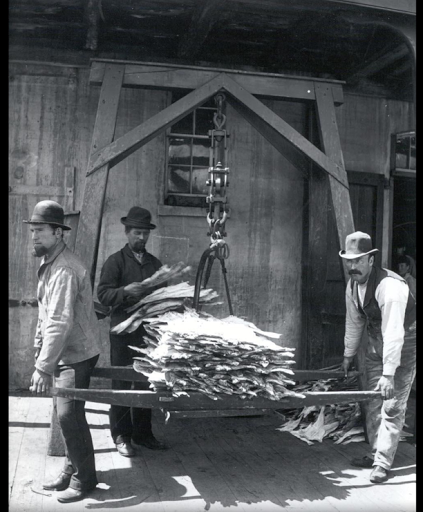 Much of our existence depended on salted protein, such as the codfish seen here. It was not only food but a source of income for our fisher families. Long before the days of refrigeration, going back to the first fishers to arrive on the shores of Newfoundland, codfish was salted to preserve it. Fish caught in Newfoundland was transported back to Europe after a fishing season on the Grand Banks. Splitting and salting the fish was standard procedure. Before it could be eaten, this fish had to be rinsed thoroughly and watered to re-hydrate it, then boiled. For many of us raised on salt cod, it is delicious. But, a piece of salt fish does not come with instructions. Today it would be easy to research how to cook salt codfish. However such was not the case on the Canadian prairies during the Great Depression. It was a difficult time for people on the prairies, when drought conditions caused a shortage of crops for income and food. At this time, fishers in eastern Canada, from Nova Scotia and Prince Edward Island were still fishing and salting the catch. 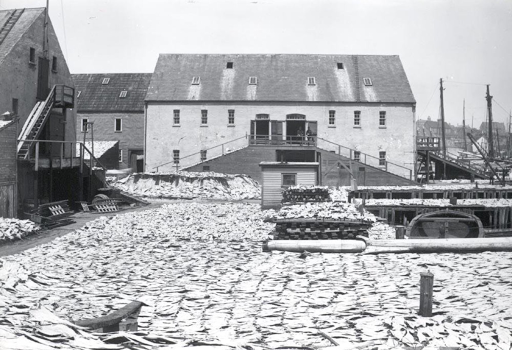 Wanting to help their fellow Canadians, Nova Scotians sent a train load of salt fish to the prairies, providing much needed protein for hungry families. One such family in Saskatchewan was teacher Max Braithwaite and his wife. He wrote about the distinctive odour of the fish which did not come with instructions, so the couple tried to fry it as it was. It was inedible of course, as anyone familiar with the product would understand. It was discarded but not forgotten nor ever tried again. 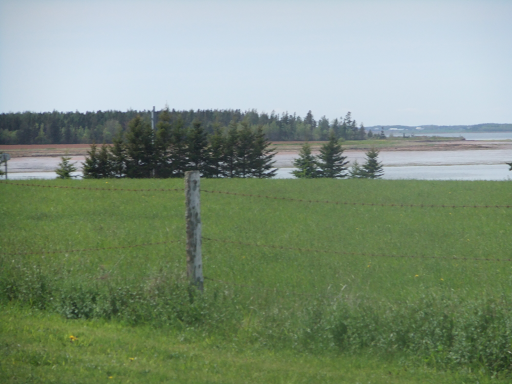 Fishers in Prince Edward Island also sent salt cod to the prairies. * There, it was reported that some farmers, not knowing what to do with it, used the hard, flattened fish to shingle their roofs. One can imagine the smell! 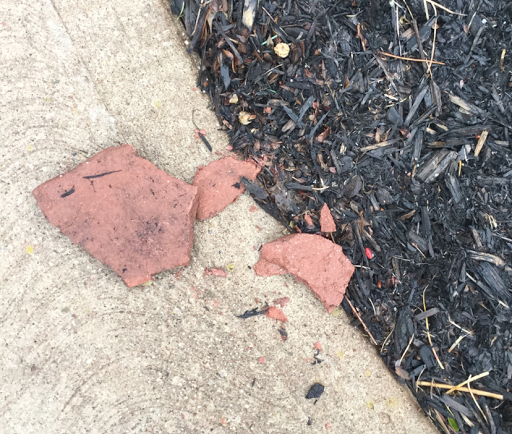 Try to imagine what happened when it rained! With a few simple instructions, people on the prairies could have made delicious fish, potatoes and onions or fish cakes, to name two of our favourite recipes for salt cod. This cod is simple food which sustained generations of people on the east coast. It was a missed opportunity for hungry westerners during the Depression, but an amusing story today. She was a sad dog! Georgie had an owie, as our granddaughters call it. 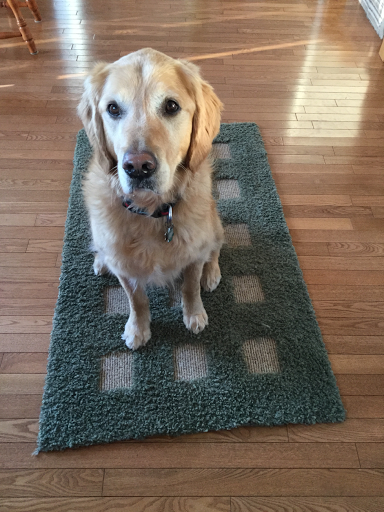 Georgie is their six year old golden retriever who stays with us when her family is on vacation. Several weeks ago, Georgie had surgery to remove a growth from the roof of her mouth. The growth was benign but there was a shaved spot on her leg where anesthetic was administered. Georgie licked the spot so much it was sore! 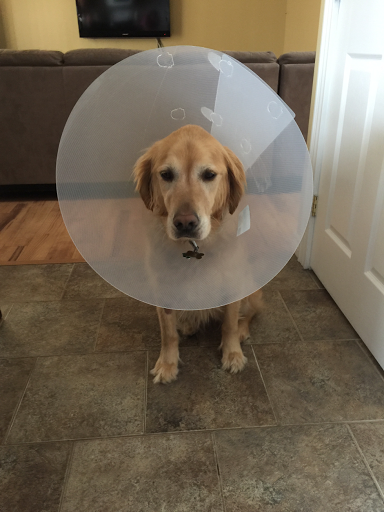 Hence, the cone around her neck prevents licking. 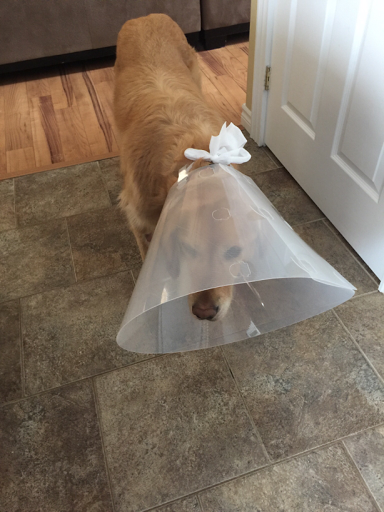 When she arrived at our house last week, we were determined to give Georgie some time without the cone. 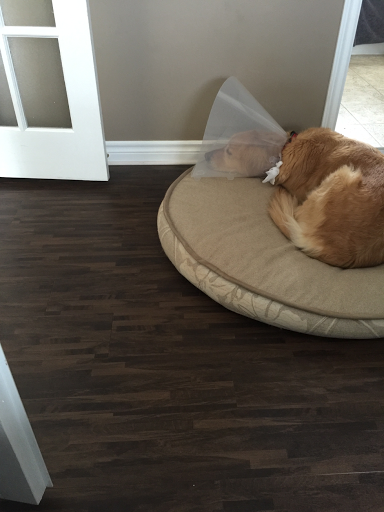 We bandaged the trouble spot and watched her carefully, using the cone at night. Meanwhile, the spot grew some hair which discouraged the licking. We weaned her from the cone completely and worked on weaning her from the bandage for the entire day. Georgie is a great companion. She is friendly, eager, energetic and loving. She is also a great deal of work. I wonder though if there is any other creature in the world who loves as unconditionally as a dog? it is an amusing, though understandable cost. 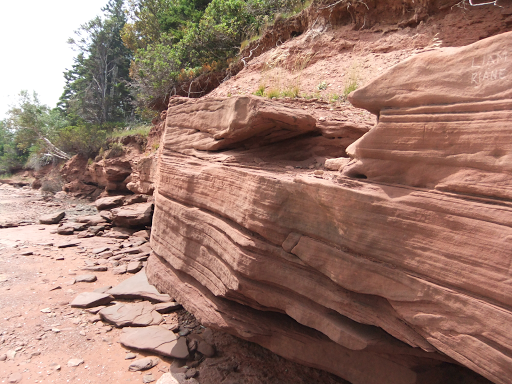 Prince Edward Island has very few rocks. 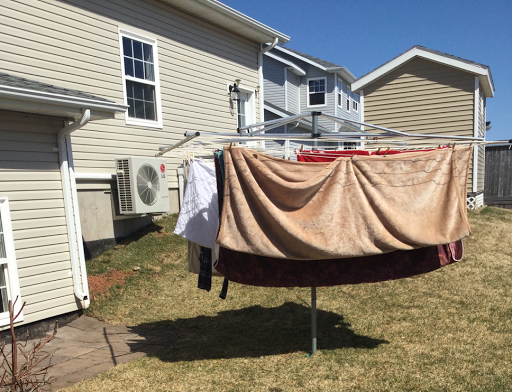 When we moved to our new island home, we put a clothesline in our backyard. 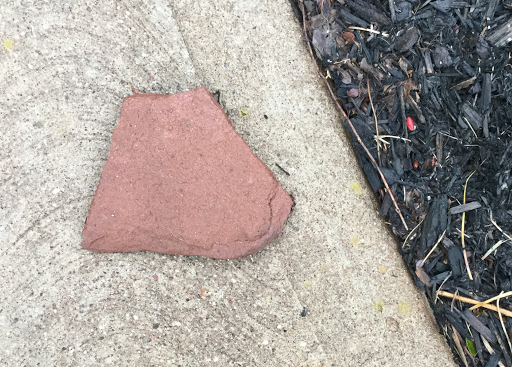 We dug a hole, set concrete for the pole and needed one small rock to put beside the pole when we put it in place. Simple, right? Not at all. Finding a rock on this island is not easy; it took four years. 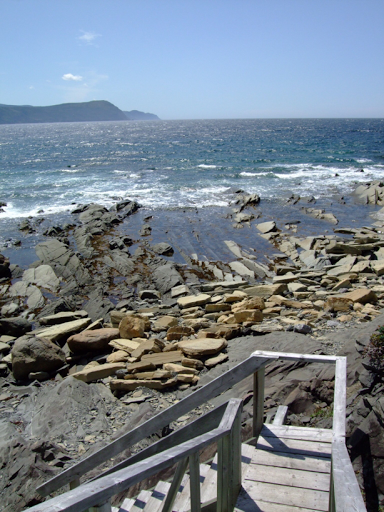 The beaches here do not have beach rocks so typical of Newfoundland and the soil is void of rocks. 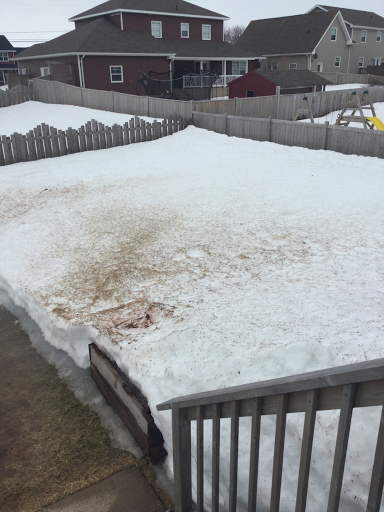 Foundations dug in our neighbourhood reveal tons of red earth, without a rock in sight. What looks like rock along many beaches is sandstone that breaks up easily. Millions of years of pressure will be required to produce rocks from this sand. We always smile to hear people speak of buying rocks for decoration in their gardens. Trucks deliver small boulders to homes here. In Newfoundland, they are trucked away. When we dug the hole for our clothesline pole in Newfoundland, it took a crowbar to pry a boulder from the spot. 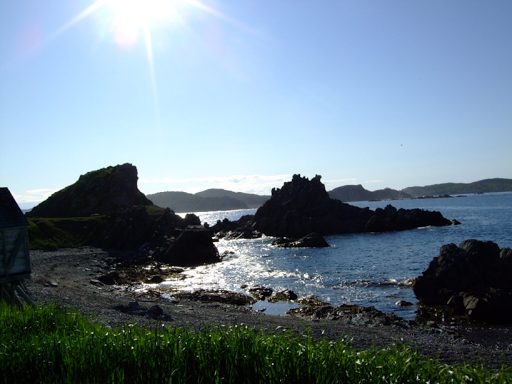 One difference between The Rock and our Garden Island is a matter of geology. 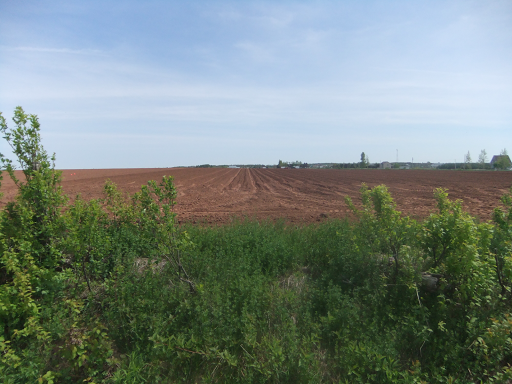 Though we chuckle at the need to truck rock into this province, the red soil, rich and rock-less, yields lots of great potatoes. However, our lifetime experience with rock has made for a curious adjustment to our current home. Having been raised by parents who grew up during the Great Depression, I had a sense of the poverty and want of that time in Newfoundland history. People did not have money; their pockets were empty. Fisherman sold their salt fish to the merchant, who graded the fish, and sold food and supplies back to the fishers based on the value of their catch. Money seldom exchanged hands as the value of the fish was rarely enough to cover the goods the fishers needed for the coming winter. Most families were indebted to the merchant from year to year. Max Braithwaite wrote about Saskatchewan, Canada during the Depression and referred to the empty pockets of the people who lived on the prairies at that time. During his first year teaching, he lived in the basement of the school, ate food provided by the families of the children he taught and was not paid until the end of the school year. He did not have a penny in his pockets. In Prince Edward Island, Canada, Marion Reid wrote about the egg economy at that time. Farmers did not have any money unless they brought eggs to the store where they received cash for them. Today many people do not carry cash although it is not due to a lack of money. Rather, we are becoming a card carrying society and the need for cash is limited. Standing in line at a store check-out, it is obvious that few people carry cash and the people who do are often seniors. Rarely do young people make payment with cash. Bank cards have taken the place of currency for many people. Times have changed but pockets are still empty. Will we become a cashless society? Will every exchange of funds for goods and services become electronic? With many of the transactions today being electronic in nature, it will not be a huge step to eliminate cash altogether. If we pay for everything with a card, will we spend more than we would if we handed out our hard earned cash for a transaction? If so, we will be no better off than the generation who was indebted to the merchant from year to year. It will take discipline to live within our means if a cashless society becomes a reality. In some ways, times have not changed all that much.